Bournemouth manager Eddie Howe says he admires the job opposite number Alan Pardew has done at Crystal Palace. Pardew has led Palace to sixth in the Premier League and they are only outside the Champions League qualifying places on goal difference. The London club travel to Bournemouth on Boxing Day in search of their third consecutive win. "I have got a lot of time for Crystal Palace and Alan Pardew," 38-year-old Howe told BBC Radio Solent. "The way they have played this season, they have been excellent to watch. "They are a very attacking side with some very good players." 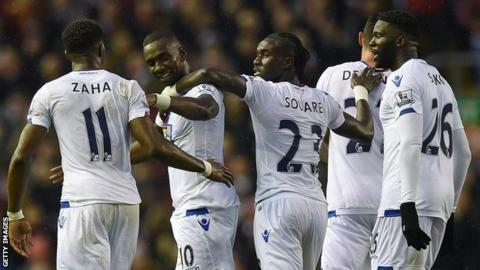 Bournemouth go into Saturday's game in good form themselves, unbeaten in five matches and having won the last three. Striker Joshua King and midfielder Junior Stanislas are doubtful for the Cherries, who could give Glenn Murray a start against his former club. Bournemouth have kept just two clean sheets this season and Howe admitted they will have to contain the threat of Palace duo Yannick Bolasie and Wilfried Zaha. "They come here in really good form, as do we, so it should be a good battle," he added. "They do have potential match-winners in their side, but if we can get our game right we can cause them problems."